I couldnt bear to post pics of unfinished projects, so I'm combining Day 2 and Day 3 and just showing the end result. Two pairs of Kids Pants with a Flat Front , thanks to Dana from Made! I printed off the pattern and tried using it as-is (meaning size 2T-3T) but shorter for a pair of Sunday shorts for my 2 year old. Apparently that kids gone through a growth spurt lately, because I wrestled with him for 5 minutes to try them on and I could barely squeeze his cute little rear in! Lucky for me, the "shorts" make a great pair of Sunday pants for my 9-month old instead! Both pairs are upcycled from polyester old-manish pants. The one on the right is an attempt to make it bigger, but I did something wrong with tweaking the pattern because I'm going to have to add an actual waistband so that its not too short through the rise of the pants. This is such a lightweight cotton, it makes this the perfect summer shirt! I drafted the pattern myself, and it needs a little work so I think a couple more tunics are on the way. My only worry about this shirt is that it might be a little girly. This was reinforced when my husband tried putting it on our daughter the morning after I finished it. I also sewed a twirly floral dress from the cutest vintage fabric (thrift store find! woo hoo!) 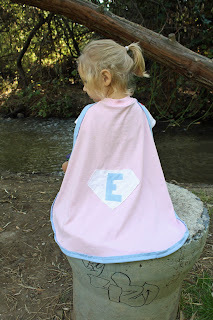 for my 3 year old daughter. She has yet to let me take pictures of her in it...isn't the terrible twos supposed to magically end when they turn 3?!?! And I whipped out a light summer cap for the baby...and he has yet to leave it on his head long enough to let me snap a picture of it! All in all, I am LOVING the Kids Clothes Week Challenge - it was just the motivation I need!!!!! This time last year I stumbled upon Kids Clothes Week Challenge on Elsie Marley, and I had every intention of joining in...but didnt. This year, I almost dont have a choice...my kids have out-grown all the hand-me-downs from their cousins (and actually are bigger than most of their cousins now!) and I can't really let them run around naked, even if the weather is finally warming up! For the challenge, you're supposed to sew an hour a day on kids clothes. My personal goal is to sew an hour a day per child. I have a tendency to want to make fun girly outfits for my 3 year old, but my two boys need clothes MUCH more than she does! I got a few yards of stretchy knit from the thrift store awhile back, so I thought I'd try to make some easy t-shirts. It would have helped if I'd thought to take my kids' measurements before I sent them to bed last night! I ended up re-doing a lot after trying them on the kids this morning. I also cut out a pair of shorts for my 2 year old (it took an hour because I had to print the pattern too - more on that for Day 2s post!) and I sewed them up this morning, only to realize they were JUST BARELY to small! The good news is, they'll make great pants for the baby! Destiny, I'll be emailing you soon! Was anyone the least bit curious about the oddball time that this giveaway ended? Well, it just happens that 7:35pm is the exact time that this Little Miss was born 3 years ago! When I was little my mom always made us a Birthday Outfit, so I tried to do that this year. But, being sick, I kept making mistake after mistake after mistake! I think it turned out okay, as long as no one looks too closely. Her favorite part is the pockets...perfect for her pennies that she earns for doing chores, or the flowers that she picks off Nana's tree. This is her smile-while-squinting-in-the-sunlight face. Her mischevious face looks a lot like this too, strangely enough. tomorrow. Or probably next week, at the rate I'm going. 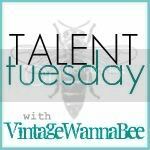 Bookshelf Puppet Theater, Stacking Puppets, and a GIVEAWAY! Hello and Welcome to all you T Shirt Diaries readers! Are you loving this Spring Stashbust as much as I am?! It feels so good to be whittling away at my stash of stuff, instead of constantly replenishing! Today I'm going to be sharing my Bookshelf Puppet Theater, as well as the Stacking Puppets I made to go with it. Oh, and my very first GIVEAWAY. Woo Hoo! You know how you think you've come up with the most genius idea in the history of the world, only to discover that somebody already beat you to it? Yeah, this is one of those times for me...kinda. After I came up with the idea of a Bookshelf Puppet Theater, and even sketched it all out, I happened to do a Google search, and found this tutorial on Infarrantly Creative. Of course, her bookshelf was a little different, so I still had to put my thinking cap on to make this work. Does it look like its missing something? This is a $20 assembly-required bookshelf we bought at Big Lots a few years ago. Its made from pressboard, and has those little metal peg things that you stick in holes on the side and then set the shelf on top of the pegs. I made the mistake of putting it in my toddlers' bedroom. Less than half an hour later it was stripped...and the worst part is that they hid the metal pegs and I have yet to find them! I also hammered a nail on each side, right near the top, letting it hang out a bit. This is where the curtain "rod" will be later. After a couple coats of grey paint (leftover from painting bedrooms! ), I added a flannel board front. And of course forgot to take pictures of the process, but its pretty straight forward. Using the backing from the original bookshelf (it was flimsy, a little bit better than cardboard though) I cut it to fit in the front. 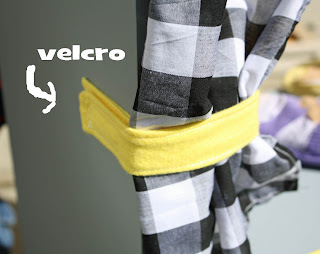 I covered it with yellow flannel, folding the edges over to the back and hot gluing them down. Then I nailed it in place. 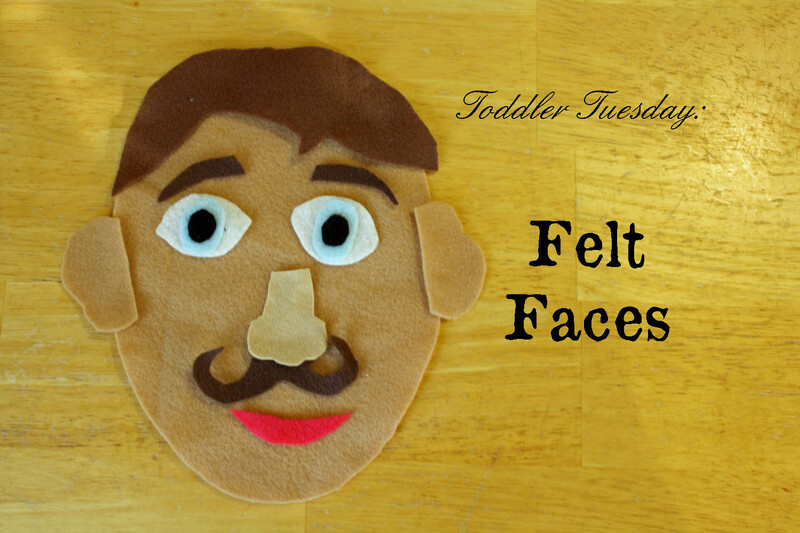 Now one of my kids can use their Felt Faces and other felt cutouts on the front while the other is putting on a show up above! The curtains were made from some black and white checked cotton fabric I've had for a couple of years. I made strips from the yellow flannel to glue on the side. It forms a loop and velcros on itself to keep the curtains back. The curtain "rod" is a wrapping paper tube painted white. I was scrambling all over the house, trying to find something I could use to hang these curtains from so I wouldn't have to break my Stashbusting oath, and finally I had this stroke of brilliance. I had to cut it a little shorter, and put a slit in one end so I could slide it over the nail, but it is surprisingly sturdy, considering its just cardboard. And there you have it...the Bookshelf Puppet Theater! But, if you have a puppet theater, you really better have some puppets too, right?! Anyways, my Munchkin will be turning 3 soon and since she is FINALLY into Princesses I thought I'd make her a set of Princess and the Frog puppets as a birthday present. I admit, this first attempt is not the prettiest thing ever. But the puppets were a BIG hit! ...or slip them on her hands so they could hug. I'll be posting the template and tutorial for these stacking puppets in the next few days, so won't you pop on back and check it out? I have one set of Princess and the Frog Stacking Puppets to GIVE AWAY to one lucky person out there! -Leave me a Comment. Any comment, although preferrably something happy. 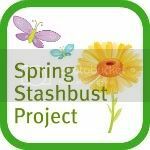 -Go on back to The T Shirt Diaries and tell Robin how awesome she is for hosting this Spring Stashbust. ***Please leave a separate comment for each entry, for a total of up to 3 entries, and if you don't have your email address linked to your profile, please leave it in the comment. THIS GIVEAWAY WILL CLOSE AT 7:35 PM (PST) on FRIDAY APRIL 1ST. We've had this piece of wood laying around for who KNOWS how long, and in honor of the Spring Stashbust, I figured it was time to do something with it! I painted it yellow and then spent over an hour carefully marking every half inch - anyone that knows me, knows how difficult that was for me!!!! 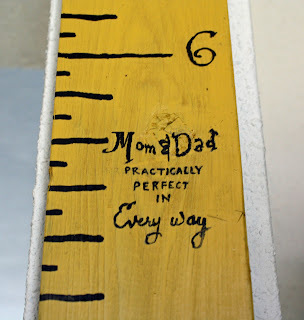 ...a Mary Poppins Growth Chart! Mary Poppins is one of my kids' favorite movies, probably because of all the awesome dancing. 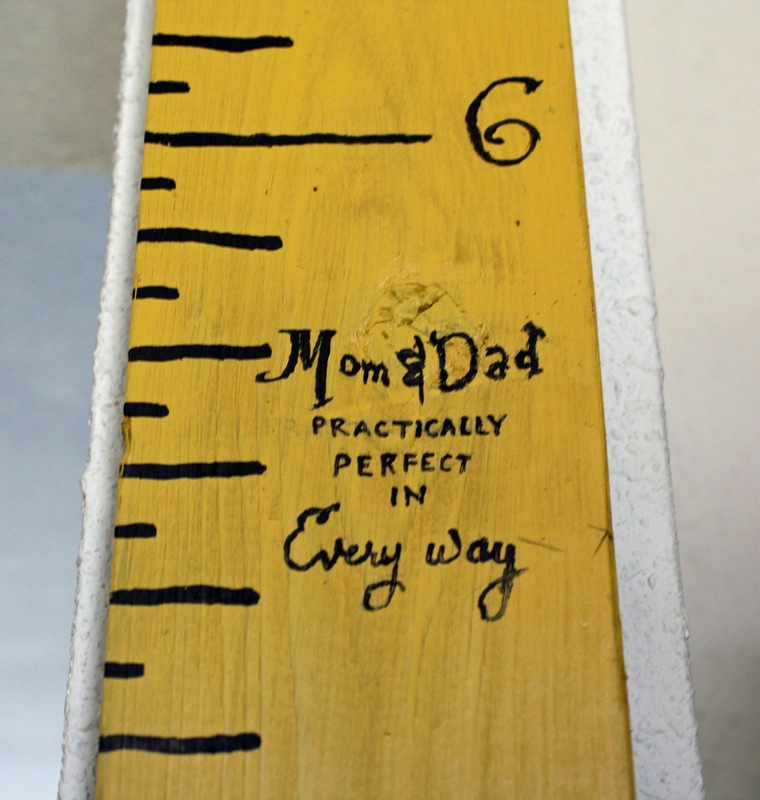 But what makes this a Mary Poppins Growth Chart and not just a big yellow ruler? My husband and I are only about an inch apart in height (he's 5'10" and I'm 5'9") and I figured my kids are so short that wont be able to tell if we're faking it a bit. Sundays are always a challenging day around here. Church starts at 9am, which is just about the time my kids are ready to be running around and playing. 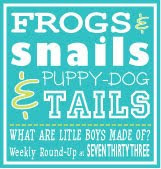 So, I've tried to find some creative ways to keep them entertained and (mostly) quiet. Using my huge stash of felt, I cut out a variety of shapes like circles, triangles, squares, etc. Originally these shapes were meant for a quiet book, but during one tantrum that involved felt pieces flying everywhere, we discovered that they will stick to the back of the pew in front of us! My kids love lining up the shapes, and my daughter is old enough to start sorting them by color or shape, so its an educational activity too. This last week I made them Felt Faces. This was a quick and easy project, I cut it out while watching a TV show with my Man (Monk, if you were wondering). I glued the eyes together with Tacky Glue, but everything else is just cut. Both my toddlers were excited to try it on Sunday. My 3 year old did pretty good getting the body parts in the right place; my 2 year old did more of the Picasso thing. But hey, it was entertaining for a good 10 minutes, which is quite an accomplishment for him! I know technically I did this project before the Spring Stashbust started, but it is busting my Stash, so I think it counts!